There were delightful sights, sounds and scents in today’s garden. A large bee buzzed and hovered near my face long enough to fan my cheek, making me smile. Late afternoon sunlight danced atop Angelonia in the meditation path. 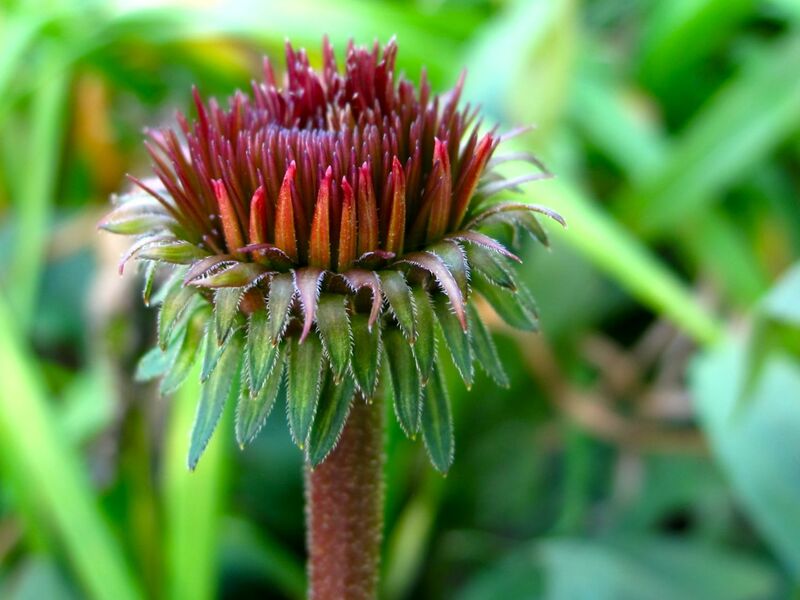 Throughout the garden Echinacea is in various stages of its life cycle. Many of the plants are fading even as new flowers emerge on others. 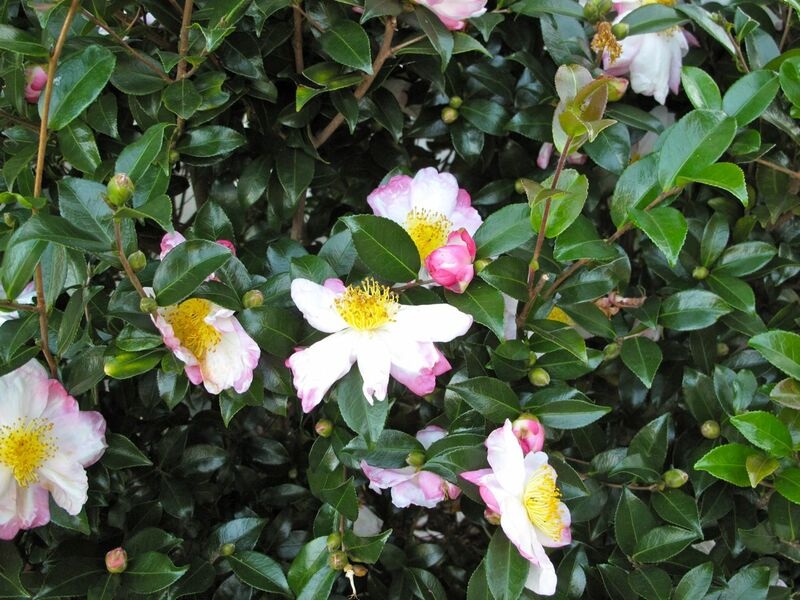 More Camellia sasanqua flowers appear daily. 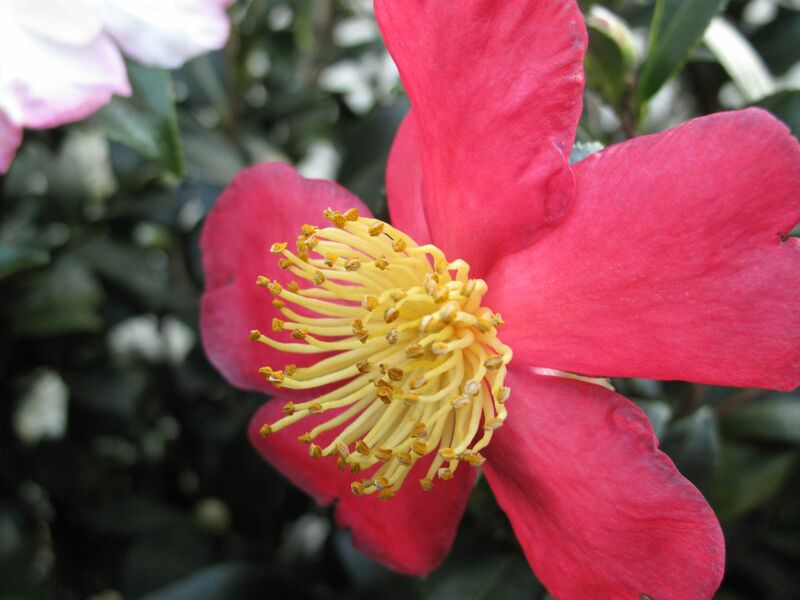 The variety of this Camellia is unknown, but it is a highly fragrant one. I noticed the first Camellia sasanqua ‘Yuletide’ blossom is open. It seems early but actually last year this shrub was blooming on October 25. Another fragrant shrub, Daphne odora ‘Aureomarginata’ (Winter daphne), bloomed from late January to March last year. Today a dainty Daphne blossom made an early appearance. This entry was posted in garden and tagged angelonia, Camellia, Daphne odora, echinacea on October 17, 2012 by pbmgarden. Such pretty blooms for this time of year. Do you feed the Echinacea, as its flowering season is so long? 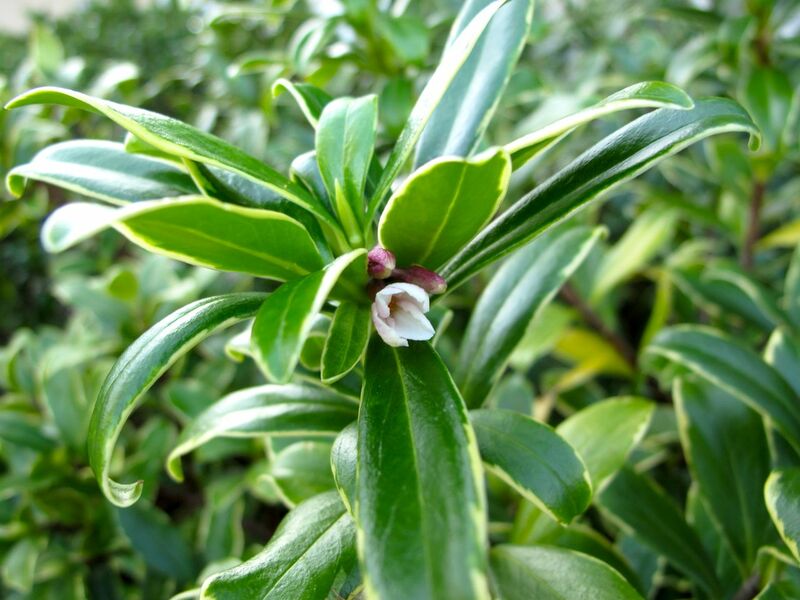 I like the shiny leaves of the Daphne, as well as the delicate flowers. Thanks Cathy. Luckily, the Echinacea survives on its own here without extra attention. The Daphne foliage is nice (and evergreen) so I use it in front of the house as part of the foundation planting. Flowers at this time of year are a joy and a bonus, we gardeners have to make the most of what is flowering now. Wonderful that your Daphne is flowering now, what a lovely scent it has. 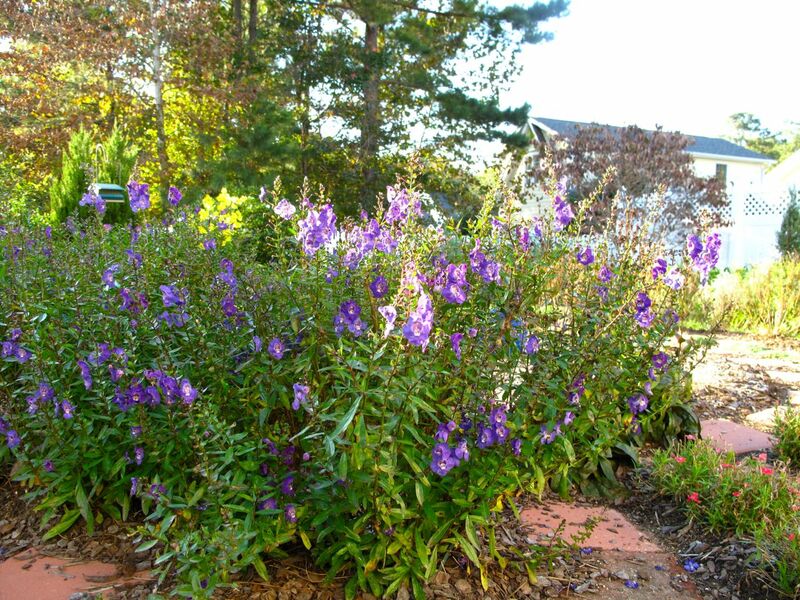 The Angelonia has been a star performer for you, lovely blue flowers looking very pretty in your sunshine. Thanks Pauline. I agree–having flowers now is quite a treat. Perhaps the Daphne flower is a fluke–its timing is definitely off. I’ll have to observe various Camellias more closely, but I think I know what you mean about the sasanquas. I am trying to root a tea Camellia right now from a cutting taken at the home where I grew up. It has a simple, understated elegance that I like. Beautiful photo of the Echinacea. We love them but sadly struggle with them in our garden. Thank you. Echinacea did well this year here but it’s not always the case.